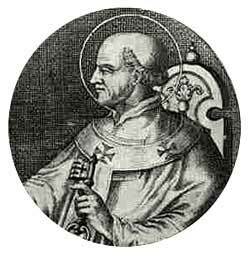 SILVERIUS was son of Pope Hermisdas, who had been married before he entered the ministry. Upon the death of St. Agapetas, after a vacancy of forty-seven days, Silverius, then subdeacon, was chosen Pope, and ordained on the 8th of June, 536. In thy strength, O Lord, the king shall joy; and in thy salvation he shall rejoice exceedingly. Thou hast given him his heart’s desire. Ps 20:4 For thou hast prevented him with blessings of sweetness: thou hast set on his head a crown of precious stones. V. Glory be to the Father, and to the Son, and to the Holy Ghost. R. As it was in the beginning, is now, and ever shall be, world without end. Amen. In thy strength, O Lord, the king shall joy; and in thy salvation he shall rejoice exceedingly. Thou hast given him his heart’s desire. Grant we beseech the almighty God, that we who celebrate the martyrdom of blessed Silverius, through his intercession be strengthened in your love. Through Jesus Christ our Lord, Who liveth and reigneth with Thee in the unity of the Holy Ghost, one God Forever and ever. R. Amen. Lesson from the letter of St Jude the Apostle: Dearly beloved, be mindful of the words which have been spoken before by the apostles of our Lord Jesus Christ, Who told you, that in the last time there should come mockers, walking according to their own desires in ungodlinesses. These are they, who separate themselves, sensual men, having not the Spirit. But you, my beloved, building yourselves upon your most holy faith, praying in the Holy Ghost, Keep yourselves in the love of God, waiting for the mercy of our Lord Jesus Christ, unto life everlasting. Blessed is the man that feareth the Lord: he shall delight exceedingly in his commandments. His seed shall be mighty upon earth: the generation of the righteous shall be blessed. Allelúja, allelúja. Ps 20:4 For thou hast prevented him with blessings of sweetness: thou hast set on his head a crown of precious stones. Allelúja. In that time: Jesus said to his disciples: Do not think that I came to send peace upon earth: I came not to send peace, but the sword. For I came to set a man at variance against his father, and the daughter against her mother, and the daughter in law against her mother in law. And as a man’s enemies shall be they of his own household. He that loveth father or mother more than me, is not worthy of me; and he that loveth son or daughter more than me, is not worthy of me. And he that taketh not up his cross, and followeth me, is not worthy of me. He that findeth his life, shall lose it: and he that shall lose his life for me, shall find it. He that receiveth you, receiveth me: and he that receiveth me, receiveth him that sent me. He that receiveth a prophet in the name of a prophet, shall receive the reward of a prophet: and he that receiveth a just man in the name of a just man, shall receive the reward of a just man. And whosoever shall give to drink to one of these little ones a cup of cold water only in the name of a disciple, amen I say to you, he shall not lose his reward. Thou hast made him a little less than the angels, thou hast crowned him with glory and honour: and hast set him over the works of thy hands. As thou hast received our gifts and prayers, O Lord, cleanse us, we ask by thy heavenly mysteries, and graciously hear us. Through our Lord Jesus Christ Thy Son. Who liveth and reigneth with Thee in the unity of the Holy Ghost, one God Forever and ever. R. Amen. He who wishes to come after Me, let him deny himself, and take up his cross, and follow Me. Grant, we beseech thee, O our God, that we who in time render joyful sevice min memory of thy saints, may be gladdened by their company in eternity. Through our Lord Jesus Christ, Who livest and reignest, with God the Father, in the unity of the Holy Ghost, one God For ever and ever. R. Amen.